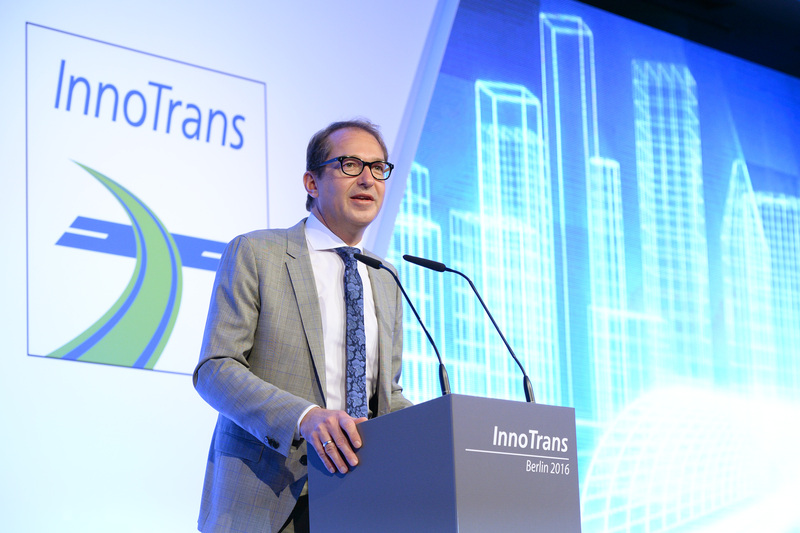 Former German transport minister Alexander Dobrindt opens InnoTrans 2016. Photo: InnoTrans. Dutch operator NS has timetabled a one-off, faster intercity service to take passengers from Amsterdam to Berlin ahead of the largest railway fair in the world. On September 17 – a day before the launch of InnoTrans 2018 – NS will run a special train from Amsterdam Central. The service will depart at 09:27 and arrive in the German capital 27 minutes faster than the usual journey of 6 hours and 20 minutes by stopping at fewer stations. Only at 11:16 in Bad Bentheim, Lower Saxony, will the train stop. NS CEO Roger van Boxtel will be among the regular passengers and guests onboard. A spokesperson for NS said it wants to symbolically show it can accelerate the train to Berlin. They added (Translated from Dutch): “Now that NS is using fast trains to London, Paris, Brussels and Frankfurt it is time to work on a better connection to Berlin. “Half an hour’s time savings can be achieved by stopping at fewer stations and making the locomotive change at the Bad Bentheim station unnecessary, which takes a lot of time. “For the latter, NS wants to order 12 locomotives that can also continue in Germany. In addition, the spokesperson said “there is a lot to be gained” from better timetable designs, particularly when it comes to prioritising international trains. NS will also operate an extra intercity train from Amsterdam to Bad Bentheim on September 17 at 9:00 that stops at the regular Dutch stations of the Intercity Berlin service. Biennially held in Berlin, InnoTrans 2018 takes places from September 18-21.